The Cataclysm in front of my eyes! I'm afraid I don't have any good news to share today. 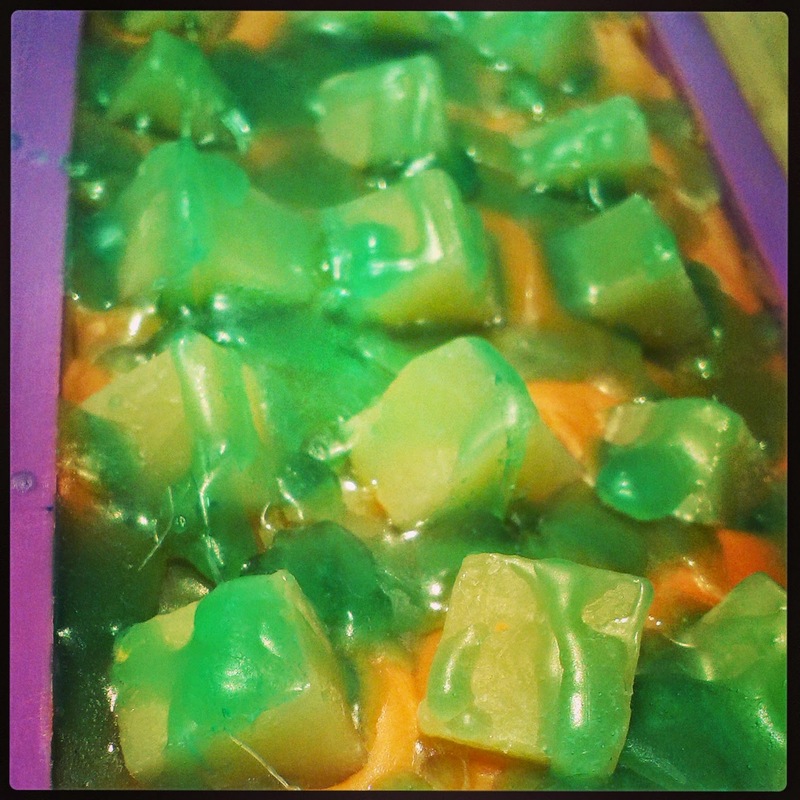 I've never used this blog as my personal vent for anything what other aspects of my life bring, nor has it ever been used for promotion my nationality, my political views, my personality, except what concerns to soaps and soapmaking. But today, I'm going to use my blog as a cry out to the world. I don't know whether you have heard or seen what's been going on in Serbia and Bosnia these days. At the beginning, worlds media didn't take it as seriously as it really is. There have been floods for days now. But, not just ordinary floods. These is the most severe rage of the nature, the greatest floods that happen once in a thousand years. In Serbia, the water has covered the area, which is bigger than the whole territory of Macedonia. Bosnia and Croatia has been suffering also. Serbia has got the worst of it, like 10 times more (financially) than other two countries. 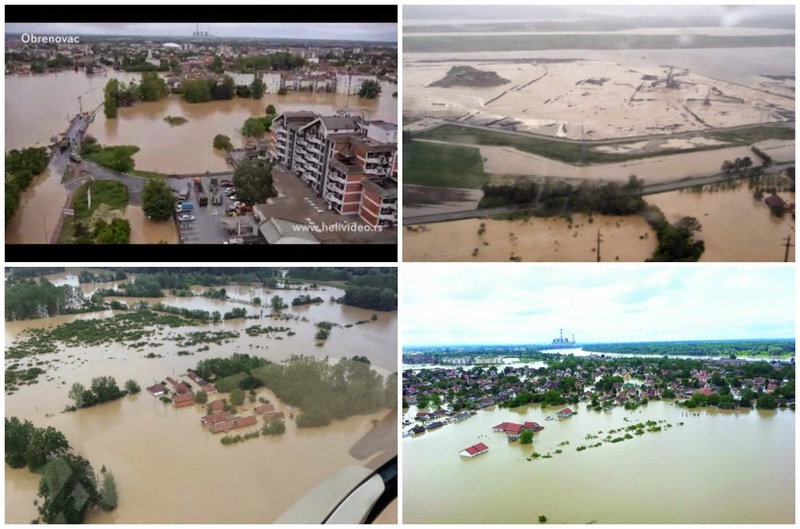 In Serbia and Bosnia, over million people have been evacuated, thousands have lost everything, having left their homes with only what they wore at the moment and one whole town, 30 km away from capital Belgrade has been flooded, is if it'd never existed. So far it's been reported that 20 people lost their lives. It's expected this number to increase when the water takes back and gets an access to the flooded area. The photo bellow showing the map of affected areas. I made it easier to understand, having put the arrows and the countries names. It looks bad, but not close to how it is in reality. Because, I have prepared a photo essay for you, to get the better picture. The video's showing a few flooded towns in Serbia, Obrenovac first and later, thousands of volunteers, trying to build a defending berm along the river Sava, trying to save what can be saved before the big wave comes. The whole nation felt the pain of the flooded towns and everyone was trying to contribute whatever and however they can. Neither army, nor police, not even the special forces sent from other countries were enough to defend the banks of the turgid, fast-running rivers. Many of the pictures you're going to see below are from this video. You can see from the picture how cataclysmic it looks. Big western media houses were pretty ignorant, showing little, or no interest in what is going on in Serbia. Then, Novak Djokovic (a Sebian tennis player and World's No.2 ) when he won his last Master Trophy in Rome (May,2014) and made his winning speech, he called the biggest World's media to finally pay attention to what Biblical floods have done the great part of his country and Bosnia. Suddenly, new river has started to flow in. The river of reporters from abroad has started to come to Serbia and they still are staying there. After having taken a tour to the flooded areas,they all were agreed with one: something like this they had never seen before. 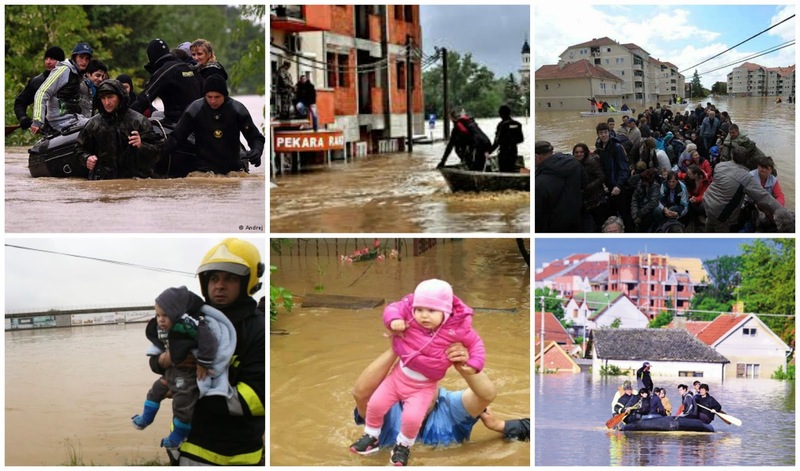 The pictures of flooded Serbia towns and villages has started to be broadcast from completely devastated and non-existed places. It was Sunday and Macedonia didn't have a weekend break. 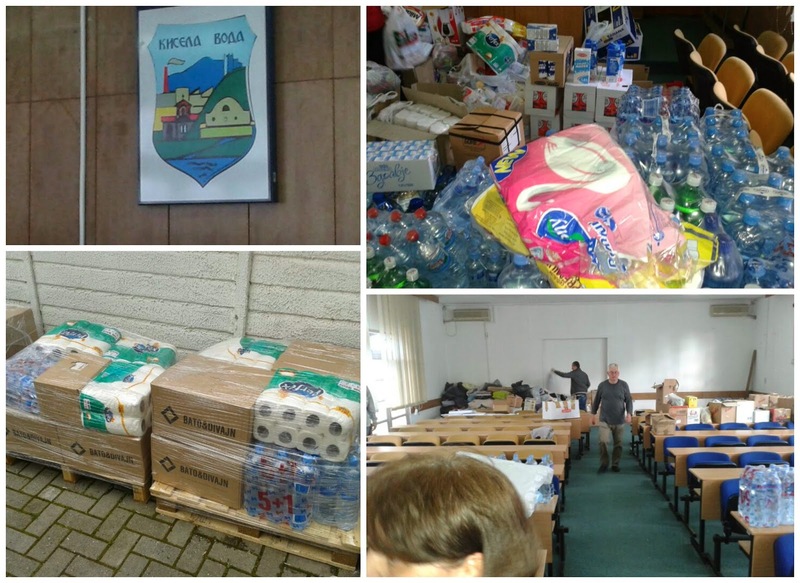 People shared information over social networks, calling for help for their brothers in Serbia. Skopje looked busy and crowded. They started to collect everything what the evacuated people were missing - water, food, blankets, pillows, sheets, all personal hygiene products, tooth brushes, underwear, clothes, shoes,....everything. 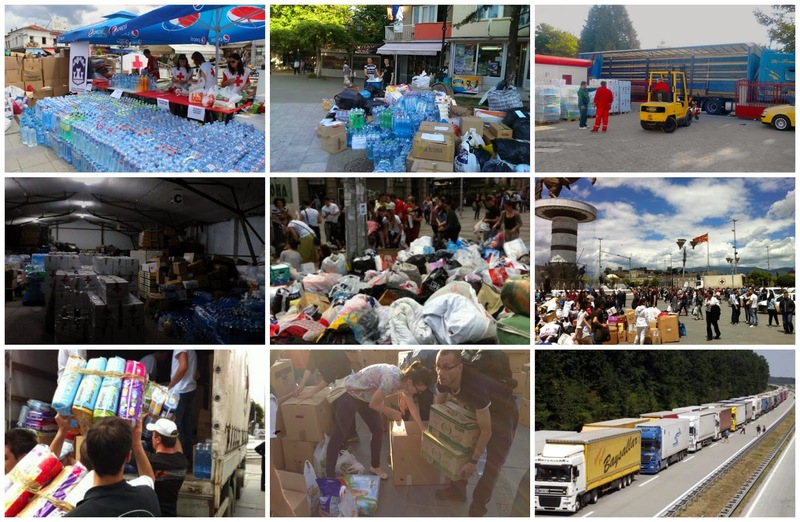 And a truck convoy, loaded with 20t food goods, 10 t hygiene products, 60,000 l water, 1000 kg baby food, 10 t of clothes- all collected in one day, was heading to Serbian border Monday morning. The Macedonian government, so as all governments from the region promptly reacted, sending professional police units, equipment and helicopters. 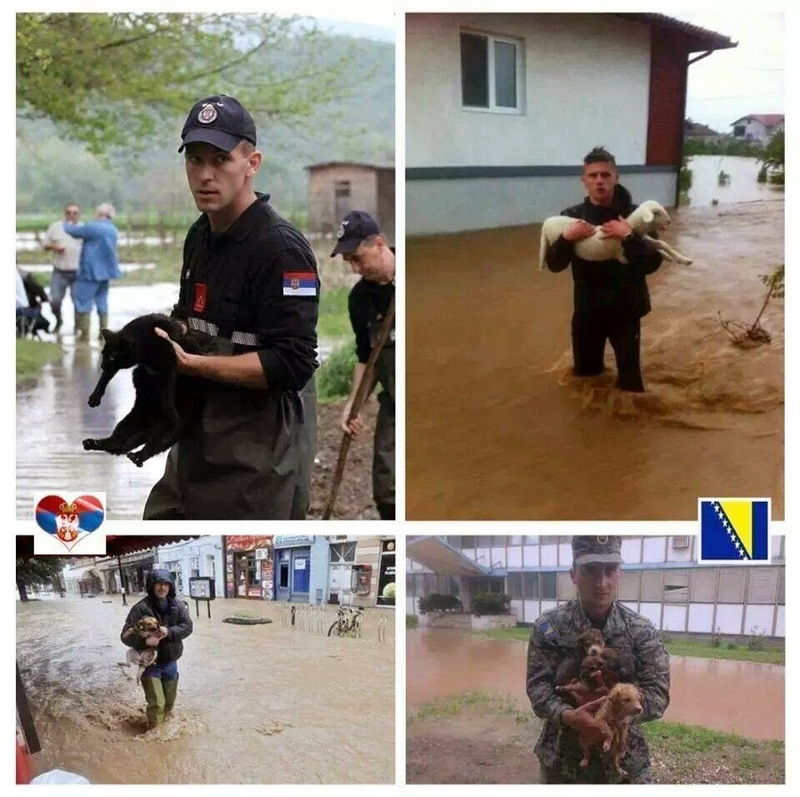 Hundreds of volunteers from all these neighbouring countries went to Serbia to help rescue operations, which lasted for several days. Macedonian factories of all kinds, big and smaller companies joined and contributed with all they produce- food, water,electricity ...whatever. The entire country was mobilized to support Serbia and Bosnia. Macedonia is a small country, with about 2,5 mil. of ihabitants, with low GDP, and with its own problems. I'm proud to say that the first day when mobile companies opened a number for donations, Macedonian people collected over 120,000 EUR (165,000 $). One donating call is 1.5 EUR (2$), so you count now how many people dialed the number. It's been said that this is the biggest, the most massive, the most versatile humanitarian action, since independent Macedonia was established, 23 years ago. This is what my husband and I found, when we went to the nearest collection spot, in our municipality, where a big conference room was put at Red Cross' disposal. This was just a part of what we saw there. People kept coming. Below are the pictures what Macedonian people in several towns were doing on Sunday, may,18th. and the convoy on its way to Serbia. This action is Macedonia hasn't been finished yet, nor will it be soon. After countries from former Yugoslavia, many others, close and far started to send their help in money, goods and equipment: Russia, EU, USA, Norway, Denmark, France, Germany, Azerbaijan, Japan, The United Arab of Emirates and many,many others. Famous world's stars have been calling for help and donating themselves. There is no money in this world that could be given to restore what has been devastated, ruined and lost, but I hope Serbia, Bosnia and Croatia will be strong enough to gather all its capacities, people, resources to fix, renew and rebuild what nature left behind in its furious run through our beautiful countries! For all of you who can help, remember, it's not about how much you can donate, a stone by one- makes a palace! Please, even if you cannot spare a dollar or two, to donate, share this post, maybe someone who can, will see it! read more "The Cataclysm in front of my eyes!" На момент, од пролетта, која никако не стигнува, ве водим на една јунска ливада, полна со цвеќиња и билки. Мирисите од нив се мешаат и можете да ги осетите сите, но сепак ниту еден не може да се издвои. 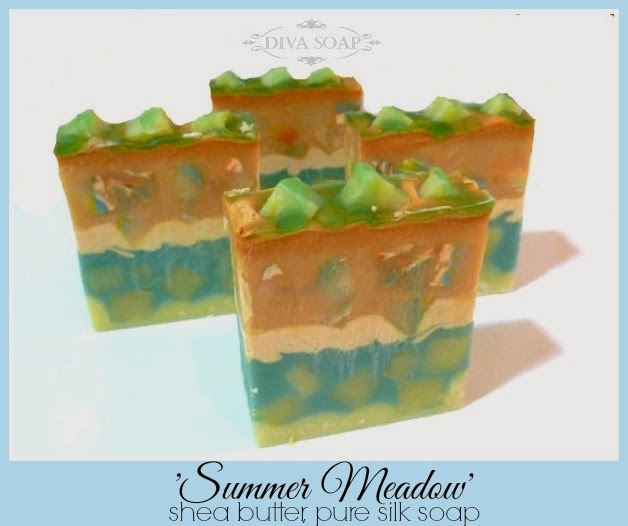 Today, I'm taking you onto vast meadow in June, full of herbs and flowers. Плумериа, ружа, лаванда, нане и трошка рузмарин даваат цветно-билна комбинација, на мирисни и етерични масла, свежа, пријатна и оригинална. Со својата свежина и без доминантна цветна нота, карактеистична за женските мириси, овој мирис спаѓа во унисекс категоријата. Одличен избор за пролет и лето. Пред да настане овој сапун, настана еден друг. The 'wild' flower here was Plumeria, which behaved really bitchy. Here you can see the first Plumeria batch. 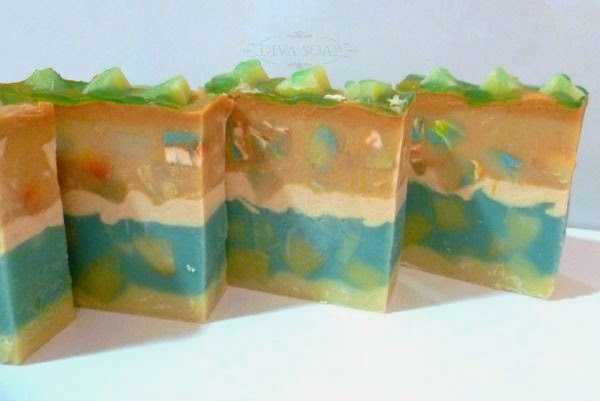 The design should have been somewhat like 'Moonstone', but by the time I took my hanger, the soap set up and, expectedly, the soap turned out not as planned. Of course, I couldn't live with it. Но, не оди се секогаш по план. Генерално, цветните мириси се познати 'bad guys' за сапуните. Тие знаат, инаку течна сапунска смеса, за миг да ја претворат во цврста и несоодветна за работа. Некој мирисни компоненти во цветните мирисни масла просто така реагираат и сапунџиите стално се трудат на разни начини да го преминат овој проблем. Некогаш, тоа е можно, а некогаш не. Некогаш, тоа знаете од напред, а некогаш се случуваат и вакви изненадувања. Но, мене овој сапун не ме остави задоволна. So, a half of the batch went into a new one. This time, I didn't want surprises. I used Plumeria again, but enriched it (or should I say diluted it? ) 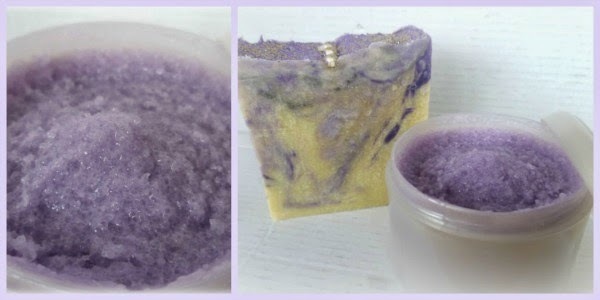 with Lavander-Amber and Rose Neroli fragrance oils, Lavender, Peppermint and hint of Rosemary essential oils, and got a very nice herbal-floral blend, that I like even better, than straight Plumeria . You can not tell any of them prevails, you just know there is something floral and something herbal. I kept the same colour pattern and, for the sake of safety, I did layers, instead of some crazy designs and swirls. Вака се чини многу подобро, нели? The soap itself is excellent. It was made two months ago and I used one up and then have started another one. There is something enchanting in it. I like its freshness, mildness and its big bubbles. I'm almost glad that my first batch seized on me, otherwise I would have never blended these oils and got this combo. Покрај основните масла, во сапунот додадов и ши путер. 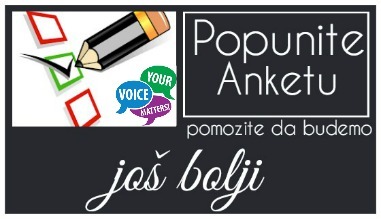 Дали треба воопшто и спомнам дека има и природна свила (тоа веќе и врапчињата знаат :-))? Сапунот е за нормална кожа. Веќе потрошив едно парче, а кога избирав кој ќе биде следен, погодете кој го земав!? Пак овој! Толку е нежен, прави богата пена, со многу меурчиња, а мириса свежо, летно, навистина фаворит за двата пола и за целото семејство. Постот за природна козметика е во завршна фаза, бидете со нас да дознаете нешто повеќе за ова интригантна тема. Прв чекор за да имате убава, мазна кожа е редовно да го отстранувате слојот на изумрени клетки. Кожата се обновува по природен пат и слојот кој повеќе нема функција, треба да се отстрани. Тоа можете да го направете било со домашно направени, било со купени пилинзи во разни видови. Ако сакате пилинг направен во домашните услови, можете да изберете омилен ексфолијант, како пченкарно брашно, шеќер, сол (морска, хималајска), итн. Овие состојки се мешат со некое масло (бадемово, сончогледово, маслиново, итн.) и со таа мешавина го истриете телото. За оваа намена, ние ги правиме Пилинг коцките (или топки), кои се состојат од рачно изработен сапун, масла и шеќер. Ако сте пробале некој наш сапун, сте добиле и пилинг коцка. Oваа коцка предизвика много позитивни коментари кај нашите клиенти. Меѓутоа, за покомфорно користење на пилинг, сега напавравивме нешто ново. Бидејки моментално уживам во 'Violet', сапунот со мирис на прекрасни љубичици, посакав и пилингот да мириса токму на нив. Бојата е светкава виолетова мика (англ. mica, приодни, минерални пигменти, кои се користат во кармини, сенки за очи, руменила, итн. ), чисто да сапунот чини прав комплет со пилингот. Што содржи: Овој пилинг се састои од некои сосема вообичаени состојки, како шеќер и масла и еден посебен- емулгатор. Емулгаторите се користат за водата и маслото (кои не се мешат) се соединаат во емулзија, која нема да се раздели. Во овој пилинг нема вода, а емулгаторот ги соединува маслата, така да личат на крема, т.е. млеко за тело. Сличните комерцијални работи се прават исклучително од синтетички состојки, а нашиот гордо се вика природен. Пилингот соджи какао и ши путер, бадемово и сонќогледово масло, лесни масла, како добра противтежа на потешките путери. Како се употребува: Емулгираниот пилинг нема моќ на чистење. Поради тоа, првен се практикува вообичаено туширање. Потоа, на телото се нанесува пилиногот. Сега се прашувам зошто порано не го направив!!?? Нешто најдобро што досега сум го пробала. По испирањето, единствено што чувствувате е мека, свилена кожа, а најдобро е што потоа апсолутно ништо не ви треба за мачкање. Кожата е чиста, сјајна, ослободена од мртви клетки, хидрирана, а вие среќни и задоволни. 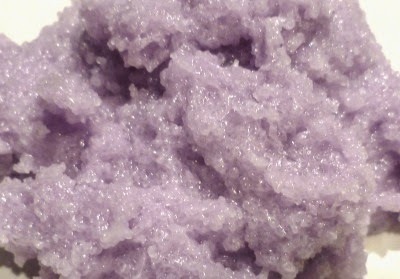 As you already have seen on the pictures, this is an emulsified sugar scrub. My first one. It feels magical. I'm wondering why took me so long to make it. 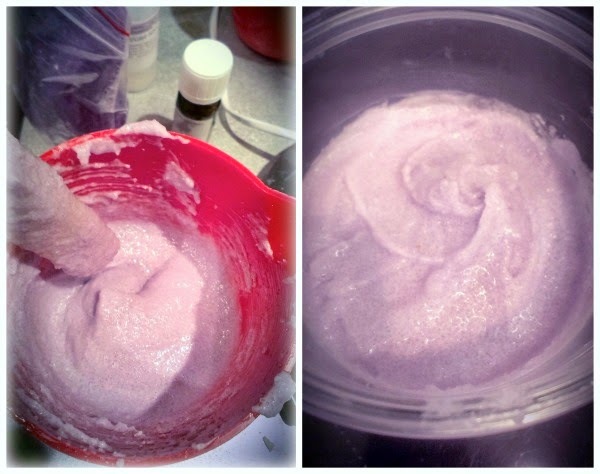 I've fallen in love with violet scent, used for 'Violet' soap and I used it for this scrub again. 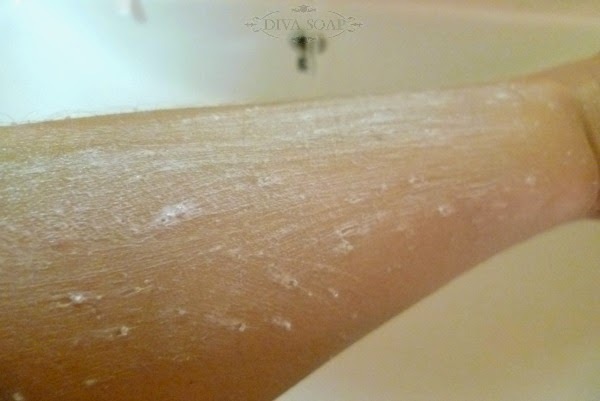 For this scrub, I used both cocoa and shea butters and sweet almond and sunflower oils. 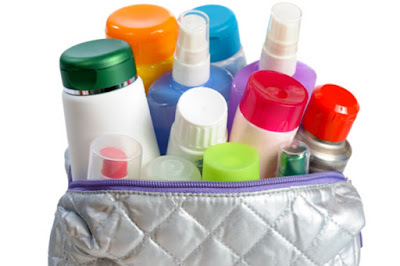 As additives, I put Stearic Acid and Cetyl Alcohol at same percentages and vitamine E. Preservative I used was Ophiphen. 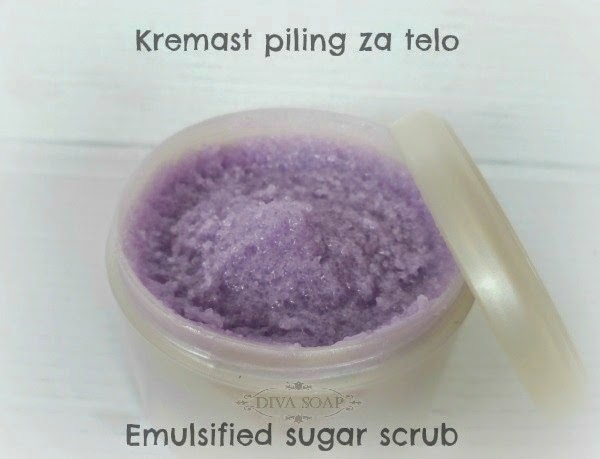 The quantity of sugar added depends on one's preferences, but I'd say 120% is a good start for body scrub. I started with 100% and after testing it, I added 20% more. Also, I think adding Polysorbate would be great here. This is a basic recipe, but I believe it can be improved. 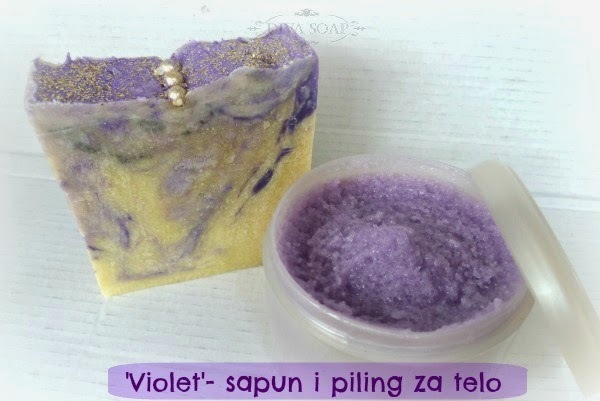 The purple comes from pearlescent purple mica, so tge scrub makes a perfect set with the soap. The best what you have after using this scrub is that silky film on your skin, the scents stays on you body and it would be a deadly sin to put something on afterwards. Еве уште нешто. Млекото за чистење шминка го правам веќе неко време, а сега го споделувам со сите. Не знам што преферирате за чистење на шминката, но некои препорачуваат тоа да биде со рицинусово масло. Јас го практикував тоа пред многу години, така што го нанесував на памукче, кое претходно го би го натопила со вода. Рицинусовото масло е многу густо и не е лесно да се нанесува. Моето прво млеко беше баш со рицинусово масло и беше многу позгодно за користење отколку самото масло. Потоа решив да пробам комбинација pицинусово+ кокосово масло. Кокосовото масло е како некое универзално масло, за се е добро, па и за чистење на лице. Млекото е обогатено со д-пантенол, алантоин, глицерин и етерично масло од рузмарин, за мојата мрсна кожа. Најважно е што млекото е на природна база, без парабени и минерални масла, кои што се наоѓат во производите за оваа намена. 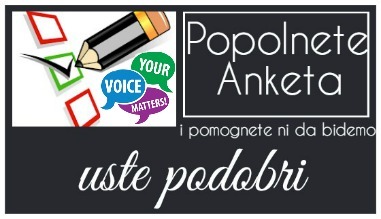 Природно, свежо, а си ја врши работата! 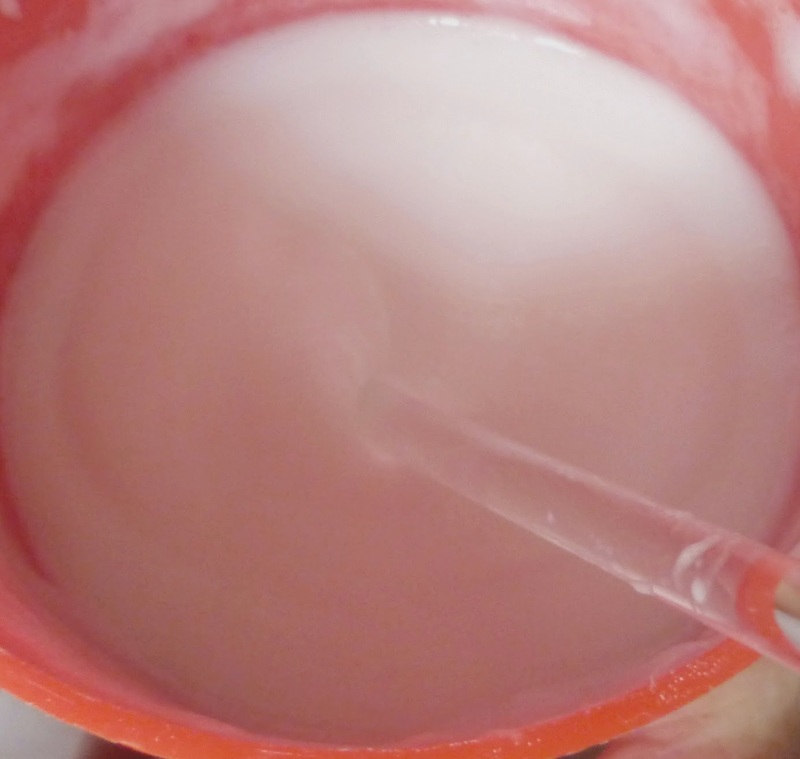 I've been making my own make -up removal milk for some time now. 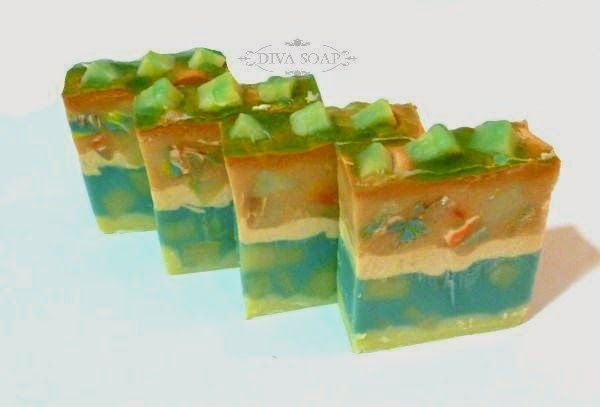 The first one I made was very simple, contained only castor oil, as castor oil's said to be good for this purpose. I remember, many years ago, when I used to use this oil as a make-up removal, I would pour a drop of it on a previously wet cotton pad, or otherwise I couldn't drag the cotton pad over my face. 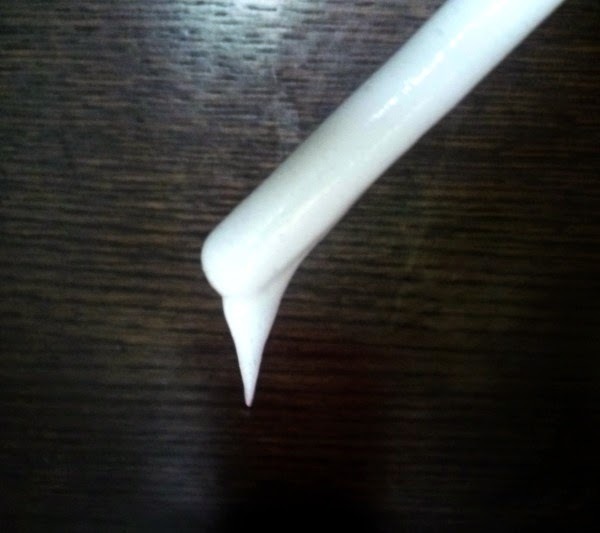 But, this practice of mine, gave me a great idea: 'Why wouldn't I make a milk of castor oil? It would keep all its benefits, but yet, it would be easy dispersable and spreadable. It worked fine, but I didn't see a reason why not to tweak the formula next time. So, I opted for coconut+castor oil combo, along with additives, such as allantoin, d- panthenol and glycerin. 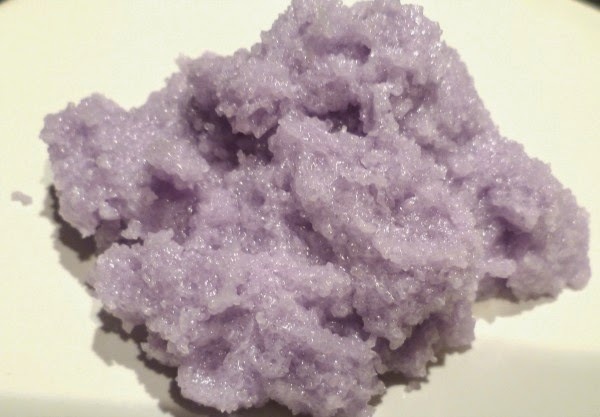 I used 3% of emulsifier (Lanette N, which is anionic emulsifying wax), so the emulsion can stay fluid. For my oily skin, I added rosmary essential oil at 0.5% (that's enough, or could I even decrease it). Once again, Geogard 221 was my preservative. It really works and I believe I will tweak it again. Just for the sake of keeping experiments going! read more "Природен кремаст пилинг за тело и Mлеко за чистење шминка"